When you're cooking on a grill and you see a burst of flame erupt from the coals when you first place your food on the grill grate (or when you flip it), you're witnessing a common phenomenon called a flare-up. These flare-ups might seem like cause for alarm, but they're actually not too serious—provided you know how to prepare for and deal with them when they happen. What Is a Grill Flare-up? Flare-ups and grease fires are not the same thing. Flare-ups are temporary upsurges of flame that result from fat dripping onto hot coals. They're a normal part of grilling and not something you have to "put out." The best way of dealing with them is simply by moving the food to a different location on the grill. 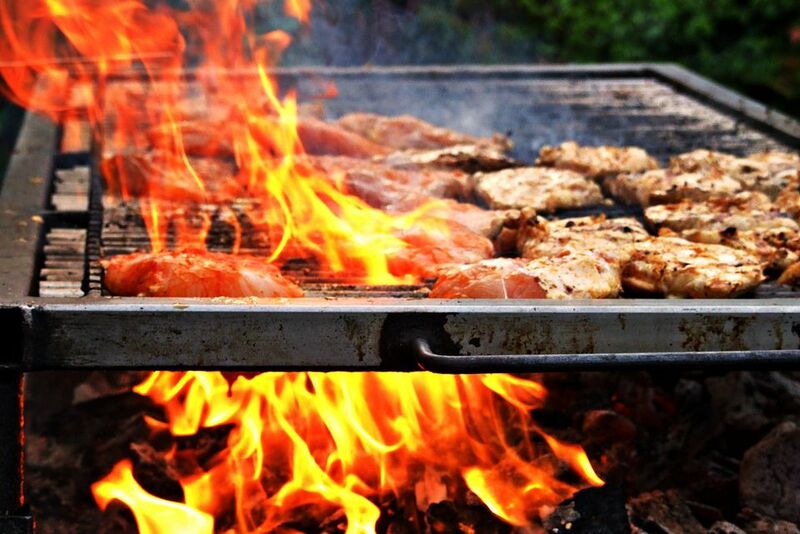 Flare-ups occur mostly on charcoal grills, since the hot coals underneath are what ignite the dripping fat. Many gas grills feature drip guards designed to divert the liquid fat from the heating element. The consequence of this, however, is that grease can build up over time, and the accumulation can cause a full-blown grease fire. One way to prevent flare-ups is by minimizing the amount of fat and oil on the food you grill. Chicken, steaks, and burgers will all drip fat onto coals during cooking. This isn't necessarily a bad thing—it's their higher fat content that makes these foods good for grilling in the first place. But excess fat and oil is another matter. The trick with steaks is to trim off all but 1/4 inch of fat from the edges before grilling. If you're marinating, make sure the meat isn't dripping when you put it onto the grill, especially if the marinade is heavy on oil. Minimizing the oil you brush onto food before grilling is another way of avoiding flare-ups. Brief flare-ups are normal and usually you don't have to do anything at all, but if one lasts for more than a couple of seconds, your first move should be to move the item to another part of the grill. But where? That's where a two-zone fire comes in. A two-zone fire simply means adding coals on one side of the grill and leaving the other side empty, creating a hot zone and a cool one. If a flare-up occurs, simply move the dripping food to the cool part of the grill and let the flare-up subside. Don't pile the coals too high, though, since the closer the coals are to the food, the more likely flare-ups become. If you have a gas grill, simply leave one section of burners turned off to produce a two-zone fire. Chicken, especially thighs and whole legs, are particularly susceptible to flare-ups because they drip a lot of fat. A two-zone fire is ideal for grilling chicken since high heat can cause it to burn on the outside before it's all the way done. If your grill is equipped with an upper warming rack, place the items there while the flare-up subsides. If you haven't built a two-zone fire—or if your grill is already full—you can always move the items to a plate. Remember, you should never try to control a flare-up (or a grease fire, for that matter!) by spraying it or dousing it with water. Spraying the coals will only stoke the flames and blow ash onto your food. On the other hand, if the flames continue to burn even after you've moved the food, or if they spread to the inside of the grill, or to the food, your flare-up has become a grease fire, and it's time to take the next steps. If matters have escalated to an actual grease fire, you're not going to be able to salvage the food, but you can often extinguish a minor one simply by starving it of oxygen. This is done by covering the grill and closing all the air vents. Whatever you do, don't put water on a grease fire. A grease fire needs to be snuffed out by depriving it of oxygen. Water will just spread the fire around. Instead, dump baking soda or a box of salt on top of it. And, of course, it's always smart to keep a fire extinguisher nearby when you're grilling, but if the fire spreads, is too hot for you to get close to it, or if the flames get to the gas hose or tank, call 911 immediately. Once the flames are out, it's time to make sure your grill is thoroughly cleaned, both to remove the baking soda or fire extinguisher residue, as well as any cooked grease that's still adhering to the inside of the grill, including the lid and grates. If your grill has a grease catcher or drip tray, you should scrub that thoroughly as well. Removing that grime will significantly lessen your chance of another grease fire.